How The Pulitzer Jury Opened Its Doors To Kendrick Lamar's 'DAMN.' And Hip-Hop : The Record The Pulitzer Prize for Kendrick Lamar's DAMN. represents a shifting tide in rap's cultural status. But a juror who helped select the prize says it means as much for an institution like the Pulitzers. 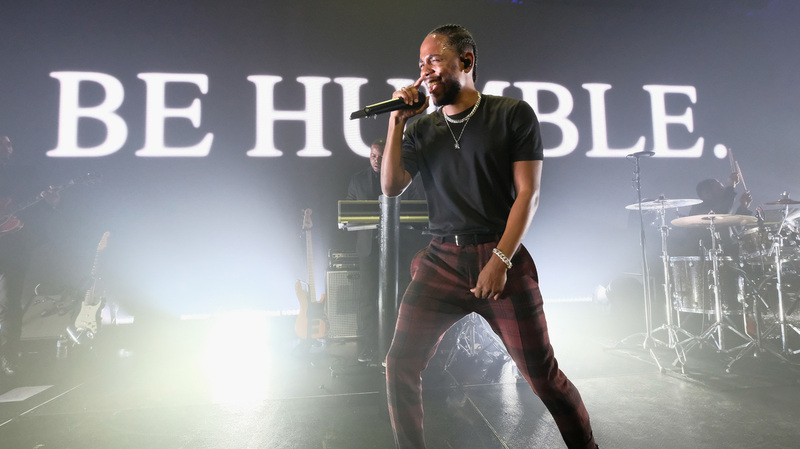 Kendrick Lamar won the Pulitzer Prize for music this week, becoming the first non-classical or jazz artist to do so. But Lamar's Pulitzer win may constitute the first time a high-minded institution has seen fit to place an insurgent and equally popular rap artist, in the prime of his career, within America's canon of heralded music composers. It comes at a time increasingly defined by unapologetic blackness, from the cinematic phenomenon of Black Panther (which Lamar coincidentally soundtracked) to last weekend's epic festival black-out now known as Beychella. Monday's announcement may have irked some in the world of classical music, the Pulitzer committee's perennial fave (though apparently not Michael Gilbertson and Ted Hearne, the two composers recognized as finalists for the award) but it's also given hip-hop heads plenty to ponder: What other rap classics, for instance, might be Pulitzer worthy in hindsight and what does this recognition mean for the future of the genre? To put some of this in perspective, I reached out to one of the jurors behind the decision. Farah Jasmine Griffin, a professor specializing in African-American literature and music at Columbia University, was one of five jurors who whittled down the Pulitzer Prize's music nominees from about 100 to three who received recognition. With an extensive bibliography on black music and arts movements spanning the 20th century — her most recent title being 2001's If You Can't Be Free, Be a Mystery: In Search of Billie Holiday -- this was Professor Griffin's first time serving as a Pulitzer juror. During our conversation, we discussed the importance of this award, both for hip-hop and the Pulitzer Prizes as an institution, as well as the feeling of optimism that follows the decision to embrace a larger swathe of American music. Obviously, there's a lot of excitement around Kendrick Lamar being a Pulitzer winner. But I'm curious about the criteria. There's a lot of conversation about what other hip-hop albums in the past may have been Pulitzer-worthy, but it's hard to say without knowing what kind of qualities you all considered. Well, I don't know that there's any one criterion. What happens is that works get nominated and then the works that are nominated have to be considered. I think that it being recognized as an award for [classical and jazz] music probably prohibits people from thinking of it as something that you would even nominate a popular music album from any genre for. So most of the nominations that come across the Pulitzer committee are primarily classical music, and now more and more jazz music or experimental music — what's more often known as art music. So, with this award, I'm hoping that we might see a broader range of excellent music that's proposed. Other than that, there's no criteria that says "it has to be classical" or "it has to be jazz." The criteria is just that it has to be deemed an excellent accomplishment, an excellent artistic accomplishment by the people who nominate and by the jury. Who nominated Kendrick Lamar's album DAMN. and what was the rest of the jury's initial reaction during deliberation? We can't really say who nominated it just because we don't know everybody who nominated everything, but I can tell you about the jury. Once it was presented, there was never any resistance to it at all. I just have to say I really, really enjoyed working with my fellow jury members because they were open. Folks were like, "Oh, OK, well let's listen." Like we did with everything else. We took it very, very seriously and had very serious and rigorous conversations about both the Lamar [album] and all of them, and then talked about what constitutes the kind of music that we should be listening to here and that should be considered for this award. It was just one of the best conversations I have been a part of. Then the decision was unanimous to include it amongst our three nominees to send forward. There was no challenge on the basis of musical taste or anything like that. These were all people who — although we all come from different parts of the music world — share in common that we like good music. So that was it. How long did the whole process take in terms of deliberations? We had 100 music selections, maybe more. So we had all been listening to them on our own. I think it ended up being two full days. We met all day Friday. We met all day Saturday. We might have even got together Sunday morning. We came in, all of us having listened to all that music, and then we had to narrow that down. And we did. Each one of us had narrowed down a list and then we had the capacity to pull up samples and listen and talk to them. It was just more a process of narrowing down, narrowing down, narrowing down, until we got to maybe five. And then we had three. So it was a lot of work. Do you remember if there were any other hip-hop nominations or other nominations outside of classical and jazz from pop genres? Not that I know of. What was interesting about the hip-hop stuff is that I don't think there were other hip-hop nominations, but the use of hip-hop was appearing in the other things, which also was part of our conversation. You would hear the influence of hip-hop in a classical piece, in a jazz piece, in an opera. So that was one of the really rich parts of the conversation. But I would have remembered, out of the 100, if there was another straightforward hip-hop piece. There was not. And so the conversation became, if hip-hop is playing such a huge influence in some of these works we're considering, why not consider the source itself? Absolutely. And I didn't feel like there was any prejudice against the form at all. Nobody questioned the enormous impact of it as a form. And then, [Lamar's] accomplishment and his genius — in any given year it could have been someone else, but it was his accomplishment and his genius this year. I would hope that we see more. How familiar were you with the album before the jury process started? I was very familiar with it. Would you call yourself a Kendrick Lamar fan? I'm a black music fan [laughs]. That's what I write about. So yes, I was very familiar with it [and] To Pimp A Butterfly. And I wasn't the only one on that committee who was very familiar. As a professor of African-American literature and music, and someone who's really written about the canon of great black artists over the course of the 20th century, how do you interpret the significance of this award? This is very significant. I think it's significant for the music, I think it's significant for the form, but even more — not more importantly, but just as importantly — I think it's significant for the Pulitzer. It says something about where that institution is and what it's capable of recognizing in this moment. All forms produce genius and excellence — and certainly black music forms have always produced that. But it's not always been recognized by the arbiters of our culture writ large. I think it says something that, in this moment, amongst all the excellent music we listened to or literature we read, an august institution like the Pulitzer recognizes that included in that is something that they might not have considered before. So it's important, I think, in an institution to change. It's very important for hip-hop and very important for American popular culture and African-American culture but it's also very important for the Pulitzer. Typically, when the media wants to talk to jurors after a major decision has been rendered, it means something tragic has happened, and oftentimes a black person's life is on the line. What do you make of the irony around this and how does it feel to be in the position where the impact of your deliberations produced a decision to be celebrated within the black community for a change? Yeah. I think it's beautiful. I think it's one of the tragic ironies of our existence here. And, you know, I think that there's really something about this moment. I mean, that's what art does, right? Art, at its best, reflects and shapes its time and its moment. And I think it maybe gives a little hope that the doors aren't completely closed, that there's still [something] that feeds us as we struggle through the muck and mire. There's still some spaces of possibility, even when we're ready to say, well, this is all foreclosed. It's never all foreclosed.